Sometimes you have more room than you need. Sometimes your family and life changes so you may change the purpose of a previously used room. Perhaps your new home has a loft space you didn’t have in your previous home. If you’re looking for ideas to use that new space, here are a few ideas. One of the biggest perks of having an extra room is creating a guest room to welcome visitors. Now the kids won’t have to play musical beds when overnight guests come over and your guests can truly relax in a space of their own. Home offices are becoming increasingly popular as more people work from home, whether remotely for a larger company or as part of their own business. Having a dedicated work space allows you to be more productive during your working hours, as well as make it easier to define a work-life balance. Say goodbye to using the kitchen table to do your crafting! Now you can spread out in a dedicated craft/hobby room so you can organize all of your tools and supplies and not have to worry about moving your works in progress so you eat dinner. Give your kids a quiet place to study and complete their homework but creating a dedicated study. Just like a dedicated office, having a designated area for homework or studying will increase productivity levels. If you were ever jealous of Belle’s library In Beauty and the Beast, create a personal library in your bonus room. Outfit the room with various types of lighting and comfortable chairs and your favorite book in peace. If you host regular game nights, what better idea than creating a dedicated game room. Add a poker table (or a regular table that can double as a poker table), display your board boards, and set up a television for video games. Now you can have fun without monopolizing the rest of the living spaces. Instead of cramming your workout machines in the corner of your bedroom or stashed in the garage, move them into a room of their own. Having your workout equipment in an accessible area will increase the chances that you’ll work out more consistently. Depending on the age of your kids, a bonus room is a great place to create a kid-friendly area of the home. For younger kids, you can corral all their toys and activities into one area, leaving the rest of your home relatively toy-free. Older kids will appreciate having a lounge area to hang out with their friends that isn’t their bedrooms. 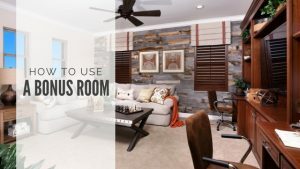 Bonus rooms are the perfect opportunity to further customize your home to fit your family’s needs. Get creative and design a unique space for you family.